X50-MS2-US - Adder AdderLink Multiscreen USB Extender, up to 150ft. Adder AdderLink Multiscreen USB Extender, up to 150ft. Adder AdderLink X50-MS Multiscreen USB Extender was designed for use in applications where computers can have their USB peripherals including keyboards and mice, high quality video and audio control extended up to 50m (150 ft.) across CAT5 or higher UTP cable. The AdderLink X50-MS provides sharp, bright and ultra high-resolution video over a VGA interface and ensures total USB compatibility regardless of the computer being controlled or the peripheral being extended. The AdderLink X50-MultiScreen adds a second video and transparent, high speed RS232 up to baud rates of 19200. 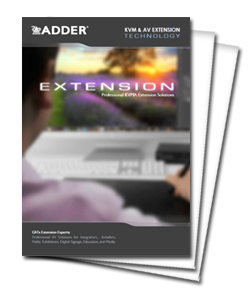 This extra functionality adds to the diverse range of solutions for which the AdderLink X50-MS can be utilized including the extension of computers with dual monitors and allow it to be used in touch screen and interactive kiosk applications. The X50-MS dual-head VGA kvm extension system supports crisp, clear and industry leading video quality at very high resolutions of 1920x1200 Full HD 1080p, 1080i and 720p with distance up to 150 feet (50 meters). RS232 can be passed between the units to a maximum baud rate 115K2. Extending Adder's RC4 remote key switch is also supported. To ensure full operation in all environments and avoid problems such as screen blanking in industrial environments caused for example by large electrical equipment switching, the ADDERLink X50-MS implements a special termination system that allows the common mode range to be extended. the ADDERLink X50-MS units can be mounted into a chassis (X-RMK-CHASSIS) that will allow 16 (X50) or 8 (X50-MS) units to be housed in 2U of rack space. X50-MS is also known as X50-MS-US, X50-MS2, and X50-MS2-US. Question: How many monitors does the AdderLink X50 support? Answer: Thank you for your inquiry. This ADDERLink X50 MultiScreen (X50-MS2) extender will support up to two monitors. Question: Is the power supply included or do I need to order that separately? The Adder X50-MS2-US Extender comes with the the rquired the power supply for operation. This is an out of box solution, so you should be good to go just buying the kit. Question: What are the main differences between the x50 series and the X-USB Pro series extenders? X-USB Pro: extends up to 200m / 650ft. X50: extends up to 50m / 160ft.